Dunérbukta is on Spitsbergen’s east coast, between Mohnbukta and Agardhbukta. In summer, people rarely to this part of Spitsbergen. If you want to walk there, then it is a tough 4-5 day tour – one way. Great hike, but long and hard. Ships rarely get to this part of Svalbard’s coastal waters, and if they do, then they will mostly find out that shallow offshore waters and lack of shelter may make landing quite difficult. Dunérbukta is much easier reached during the winter season, when it takes only a few hours to get there by snow mobile. 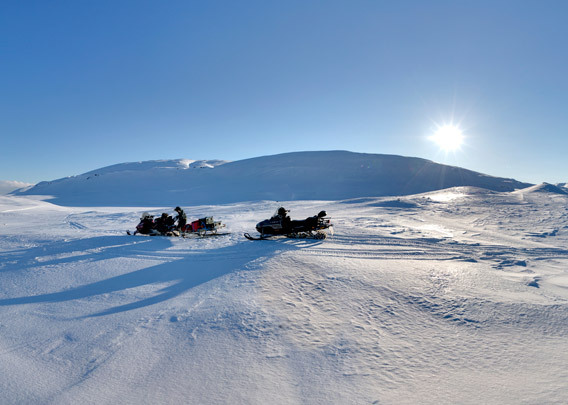 It is mostly locals from Longyearbyen who take the trip to Dunérbukta in the winter season. For tourists, Mohnbukta further north is more common. 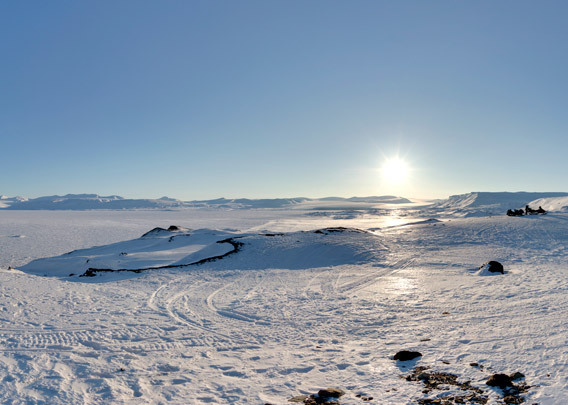 Locals (and only they) may use an old trappers’ hut that is now administrated by a club in Longyearbyen to spend a cosy night or two, and to take a trip to Ulvebreen’s glacier front from there and maybe to enjoy the view of a polar bear roaming somewhere out there on the ice.